We always respond to people’s genuine questions, but I rarely defend myself to critics, knowing it seldom makes a difference when their minds are already made up. But when lives of unborn children are at stake, I and our staff believe in going the extra mile to speak up for them. I really appreciated Kathy’s and Stephanie’s responses, but unfortunately very few people read them since they were buried under other comments. I wanted to share them in this blog so many more readers would see them. They’re important, as the same statements are being commonly made, and you may have conversations with those who simply don’t understand abortion-related laws and how courts have routinely interpreted the meaning of ”health” to be not only physical but also mental, emotional, and financial. This is an unusually long blog, but for those confused by the debate, and seeking to understand the issues, and how to respond to those who see it differently, I think it’s worthwhile. I should add that I have certainly seen prolifers overstate and misstate things—just as I’ve seen prochoice people do the same. That’s a given. The question is, in THIS case, what is true and what isn’t? I hope this dialogue is helpful to you. Mr. Alcorn is presenting as fact lies that he knows are untrue. Kind of calls into question all his books, doesn’t it? “This means a baby can be aborted any time before birth, for any reason.” This is plainly a calculated lie. So it is not a lie, calculated or otherwise. There is nothing in the new bill that would prevent the killing of a baby at any stage because of how mother’s health can be defined. And there is no protection for the baby if it is “accidentally” born alive either. It can legally be left to die. And there are doctors who do late term abortions at any stage. These are the facts, sadly. This person’s response was, “I am sorry you believe this fairy tale.” I certainly wish this were a fairy tale. But having dealt with abortion clinics, abortion doctors, and many women who have had abortions, I can tell you that without a doubt, this is true. The fairy tales are believed by people who deny what those of us who know the abortion business, and the women, know to be true. Randy addressed this issue in the blog. Abortion for a woman’s health can and is frequently interpreted broadly and it would be untrue to say it’s not. The blog quoted Doe v. Bolton, which said abortions were legal “in the light of all factors—physical, emotional, psychological, familial, and the woman’s age—relevant to the well-being of the patient. All these factors may relate to health.” It can refer to all kinds of considerations, not just ones where the woman’s life is literally in danger. Even in those cases, third-trimester abortion is not necessary, though delivery certainly might be. As I understand it, the part of the law that states that a woman may terminate a pregnancy after 24 weeks ‘if the health of the mother is at stake’ is the part of the law that has always been there. The only thing that was added to this section is an additional qualification of ‘if the baby isn't viable’. Statistically, a late term abortion is very, very rare. Less than 1.5%. And it is irresponsible to suggest that suddenly there is going to be thousands of women with healthy babies in their 8th month lining up for abortions for any reason. IF he wants to talk about the “broad interpretation of health” then he needs to do some research and bring actual statistics into the post. Does this happen? How often does this happen? How are doctors broadly interpreting “health”. What are the actual statistics of late term abortions, and why are mothers choosing this? This would be a far more responsible way to approach this issue. Stating that the law allows for women to abort after 24 weeks “if necessary to preserve the mothers health or if the fetus isn't viable” (which is how the actual law is worded), telling people that “health” can be interpreted broadly but leaving out that this has always been the case, and then implying that “This means a baby can be aborted any time before birth, for any reason” is inflammatory, dangerous and divisive, as clearly evidenced by the comments on this post. 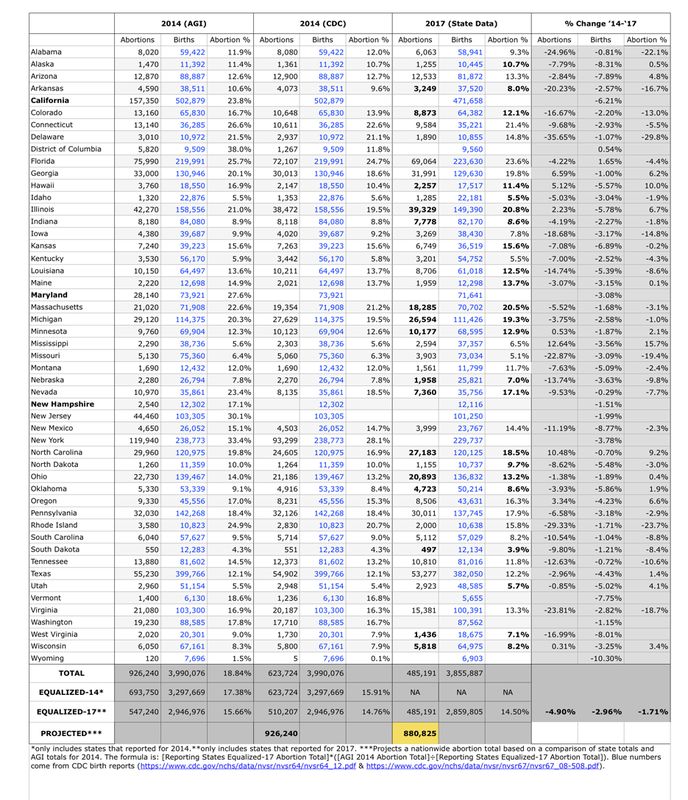 You mention that statistically, late term abortions make up less than 1.5% of all abortions. So in 2017 approximately 882,000 abortions (see this table) were performed in the U.S. That means that approximately 13,230 late term abortions were performed in 2017. Please take the time to listen to this short explanation by an OB/GYN who explains the procedure of a late-term abortion. This barbaric procedure is happening thousands of times every year! Those reasons could all broadly be interpreted [and in fact often have been] as related to a woman’s mental, financial and/or social health. What abortion doctor is going to tell a woman requesting an abortion for those reasons, “No, I won’t perform one. Those issues don’t relate to your health”? As shown by the Doe v. Bolton ruling, those issues can ALL be interpreted as related to it. So what the New York law effectively does is say that abortion after 24 weeks is now legal in any case as long as it can be said it pertains to a woman’s health. Scripture tells us to “speak up for those who cannot speak for themselves” It’s not “inflammatory, dangerous and divisive” to warn women about the harm of abortion, and to speak to the dangers for our society when our culture embraces abortion. The law DOES expand abortion (otherwise, those who are pro-choice in New York wouldn’t be celebrating!) and so the prolife response and concern is merited. If speaking the truth in love hinders someone from coming to Jesus then they aren’t interested in knowing the real Jesus but a caricature of Him. You only truly love someone when you tell them the truth. Jesus was the perfect balance of grace and truth. Abortion hurts women and kills babies. And that’s the truth. And we need to share that truth in the spirit of love and grace. And yes, there ARE many people out there “getting their hands dirty” and ministering to these mothers. Here’s one such group in New York. But that doesn’t mean we can’t do both: speak out publicly against abortion, and minister to women in need at the same time. And that’s exactly what many prolifers are doing. So if, by your own admission, the statistics for how often “health” is interpreted more broadly than you’d like, don’t exist, how then is it honest or truthful to claim that the law is being abused? And how can you claim that these sorts of posts are ‘speaking the truth in love’? The context of that phrase was spoken by Paul to the Church as an encouragement for them to build unity within the church. As far as I know, the bible never commands Christians to force our beliefs or morality on anyone outside the church. So how can this be interpreted as loving to anyone outside the church, even if it is truth (which is questionable)? Stephanie again. And no, It’s not forcing our morality on anyone to speak up for human life and say it is wrong to kill innocent human beings, and to warn women of the heartache and pain that abortion brings. (Jackie Hill Perry shows us an example of that here.) True love acts in others’ ultimate best interests, and doesn’t just say what they want to hear, even though it may not sound “loving” to say that abortion kills children and harms women. There is no point in continuing to respond in this thread, because we are just going around in a frustrating circle. We clearly disagree with each other. I grew up on Randy’s books and other pro life rhetoric. I believed it for years. I still consider myself to be personally pro life, but I have learned the truth about the sordid history of the movement and I can see how the whole issue is used to manipulate voters into voting into office horrible people just because they are pro life. So I cannot in good faith or with any integrity stand with or for the blatant manipulation. You are free to disagree with me, as you clearly do, but if you’re interested in learning more about the history of the pro life movement, NPR has a great series on it. Randy again: I’ll add a few final thoughts. One of the commenters referenced Christ’s words about a millstone, and said talking about abortion could cause us to violate what Jesus said. Here’s that verse: “It would be better for him if a millstone were hung around his neck and he were thrown into the sea than for him to cause one of these little ones to stumble” (Luke 17:2). I’m struck by the sheer deception-based irony. Instead of being used to encourage people to be careful not to make little ones (including His young disciples) stumble/be hurt, which is Jesus’ intent, it is misused here to villainize those who are standing up for little ones to...what? KEEP THEM from being horribly hurt. And by extension, this could apply not only to the children harmed by abortion, but also to the women who are fed the lies and harmed by abortion. We shouldn’t be surprised that the issue of abortion is surrounded by both outright and subtle lies of all varieties. Jesus said of the devil, “He was a murderer from the beginning.... When he lies he speaks his native language, for he is a liar and the father of lies” (John 8:44). It is no accident that Jesus speaks about Satan’s murders and his lies in the same breath. Lies are the wheels that turn every holocaust. To pull off his murders, Satan tells us eloquent and persuasive lies. He masquerades as an angel of light (2 Corinthians 11:14), calling right wrong and wrong right, making people think they are taking the moral high ground even as they defend something unspeakably immoral. No doubt about it: the abortion battle is being fought in the realm of thoughts and ideas, and even Christians are frequently taken in by the devil’s lies. That’s why Paul says, “We demolish arguments and every pretension that sets itself up against the knowledge of God, and we take captive every thought to make it obedient to Christ” (2 Corinthians 10:5). Last Tuesday, on the 46th anniversary of Roe v. Wade, the New York Senate passed the Reproductive Health Act. As Russell Moore explains, in effect, it “removes any protections as persons from unborn children at any stage of pregnancy.” This means a baby can be aborted any time before birth, for any reason. Prolifers Don’t Care About Women? It’s possible to speak out about injustice without having a solution. However, I agree that those pointing out injustice should seek to be part of the solution.